DISCLAIMER: Information in this section was compiled as part of the Building in Wildfire Prone Areas project in 2009. This information may or may not be up to date. More recent information may be available from the Insurance Institute for Business and Home Safety, the California Wildland-Urban Interface Code Information, and the CAL FIRE Wildland Hazard/Building Codes site. This community wildfire hazard assessment is based on current scientific understanding of how homes burn during wildfires. It focuses on 1) making homes safer in terms of embers, flames, and radiant heat from wildfires, 2) on breaking up continuous fuels, and 3) on actions that homeowners can take to reduce hazards. If your home or community are located in the wildland-urban interface -- an area where homes and wildland areas are in close proximity to each other -- you may be worried about wildfires. Homes located in these areas must be protected from radiant heat and direct flames, and, particularly, embers. It is increasingly well understood that many homes are lost during wildfires due to embers, or firebrands, that travel over many miles and end up, for example, entering an attic through an uprotected vent. Once near or inside your home, embers can smolder and eventually start a fire that damages or destroys it. Your home can be hit by embers for many hours as the fire approaches and recedes. 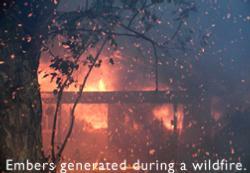 As a fire advances, a home and surrounding vegetation are exposed to embers. A home and surrounding vegetation are exposed to the flaming front of a fire for only 5-10 minutes. 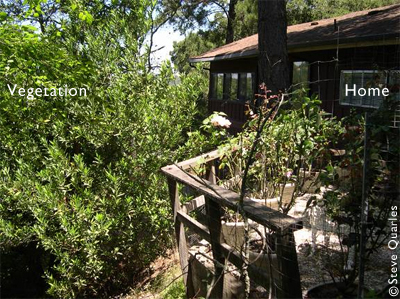 A home and surrounding vegetation will be exposed to pre- and post-fire conditions for much longer. These diagrams illustrate the fact that protecting homes against ember intrusion is critical. However, it is something that must be done by homeowners. Therefore, the wildfire hazard assessment that we have developed is designed to help communities reduce wildfire hazards by focusing on things that individuals and communities can do to reduce wildfire hazards on their property. Why would my community want to do this? Community members are dependent on each other in many ways -- we work together to build and repair infrastructure, strengthen schools, and protect resources. Reducing wildfire hazards also requires a community-level approach because when it comes to wildfire, a weak link can put an entire community in jeopardy. Homes (building materials and design) and surrounding vegetation or other fuels (e.g., wood piles) are a "package deal" (see photo below) -- you cannot reduce your overall fire hazard without addressing both. In addition, across a neighborhood or community, wildfire hazards on one parcel can impact neighboring parcels. The good news is that even in highly fire-prone areas, there are steps that communities can take to reduce wildfire hazards. Completing a community-wide hazard assessment and communicating the results with homeowners is one way to help prioritize hazard reduction activities. This can be done in combination with an evaluation of larger-scale wildfire hazards like nearby wildlands or other hazard reduction strategies such as fuel breaks. While there are other approaches to wildfire hazard assessment out there, this one represents our best understanding of how structures burn during wildfires and focuses on things that individuals can do to protect themselves and their communities. What do we need to do an assessment? One of the most difficult tasks in completing a community-wide wildfire hazard assessment can be deciding exactly what should be assessed. Here we provide a science-based approach to assessing wildfire hazards at the structure (home) level. While there are other wildfire hazard assessment approaches out there, this one was designed with the best scientific understanding of how homes burn during wildfires, and focuses on things that homeowners can do to reduce fire hazards. The assessment form is divided into sections based on specific structure components, for example, the roof, siding, and windows. These sections are on the assessment form in order of the most important component in terms of wildfire protection. For example, the roof section is at the top of the form because the roof is considered to be the most important component in protecting a home from wildfire. Then, within each section, the questions are also listed in order of priority. To view a series of demonstrations that provide further information on structure components and their interactions, please visit our YouTube Channel. You can rate answers to questions based on the hazard level given for each “yes” answer on the assessment form (for example, answering yes to question R1 yields a “high” hazard rating). If desired, you can also calculate an overall score for each parcel using these guidelines. The Community Wildfire Hazard Assessment forms (this form is available here as a pdf, but if you are interested in the original file that could be used to create a form for a handheld device, please contact us at firecenter (at) nature dot berkeley dot edu). Guidance on creating a ranking system for your assessment. A field guide for more in-depth guidance on completing the hazard assessment. A series of Frequently Asked Questions and answers about completing the hazard assessment. A sample notice that can be used to communicate with homeowners in advance of a community assessment. A full user guide that includes all of the documents described above. There are many potential ways to communicate the results of a wildfire hazard assessment with members of your community. For example, simply mailing the results to homeowners, along with general information on reducing wildfire hazards, may suffice in some communities. In others, creating targeted suggestions for specific homeowners may be more desirable. One particularly good approach for some communities is the use of web-based maps. The web-based map approach is an easy way for community leaders and homeowners to identify particular areas of concern. A web-based mapping application (webGIS) interface that allows users to explore both their report card and the results of the assessment throughout their community. WebGIS is particularly useful in this context because it readily portrays the spatial configuration of hazards in a community. This type of webGIS system can also be created using ESRI’s ArcIMS product and many types of open source tools, though this type of effort would require specialized knowledge by a trained technician.